Location: Poinar residence, Corvallis, Oregon. George Poinar (b. 1936) is a Courtesy Faculty member in the OSU Department of Entomology who has lived in Corvallis since retiring from the University of California, Berkeley in 1995. Poinar is internationally known for his groundbreaking research in Paleoentomology. In the mid-1970s, Poinar and his wife, Roberta, created an entirely new field of study when they began actively collecting, analyzing and describing long-extinct insect and animal specimens that had been trapped for millennia in fossilized amber. Poinar's work inspired author Michael Crichton to write his best-selling novel, Jurassic Park, and indeed, many of Poinar's scientific discoveries - ranging from extinct flowers to giant fleas to a theory that parasites may have killed off the dinosaurs - have made headlines of their own. 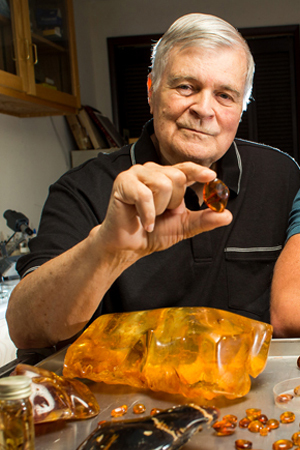 In his interview, Poinar discusses the path that he followed through academia, the many travels that he has taken in pursuit of scientific discovery, and the details of his pioneering work with ancient amber.